Make life easier for your registered customers and increase your online sales! Autologin can be easily integrated into any email template in Magento. Simple way to export customer data from Magento into an email campaign software, such as Mailchimp and Campaign Monitor. The Autologin link will always be secured by the SSL layer in your store. Autologin can be used to smoothly assist your staff in helpdesk operation. You can login as customer to follow their questions via the backend of your store. Yes, it’s. Autologin do not introduce additional security risk. Magento required only email address to recover the account password so if someone can read the mailbox he will get anyway the access to the magento account.It’s important to advise customer to not share mail. Can you login integrate with a External Smtp Extension? Yes, it does out of box. How to import the Autologin? From Backoffice, click Customer/Autologin and export customer list in xml or cvs. The locale for my country and language is not listed in the supported locales for Autologin. What should I do? If you locale is currently not listed in the supported locales, you can follow the instructions provided in the Autologin PDF guide to create your own locale translation for Autologin. You can use the license for one domain name only (including all 3rd level sub-domain name). unlimited domain names and websites. 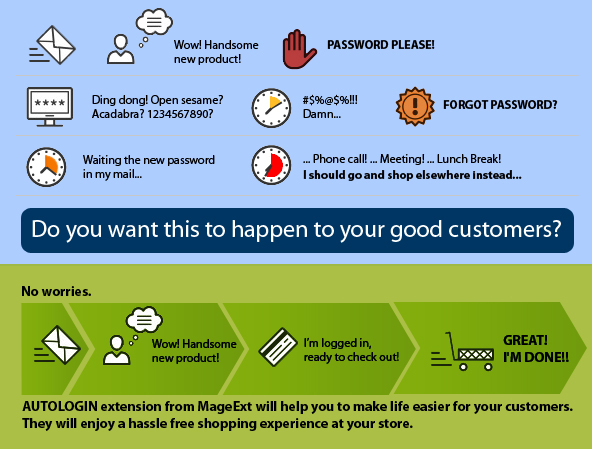 MageExt is a association of Magento -real- experts. We strongly believe in the potential of the Magento Commerce platform for e-commerce stores and we love to interact with the Magento community. This is proven by the fact we have developed and keep healthy few of the most downloaded free extensions on Magento Connect. Our Magento extensions provide innovative features and great value at an affordable price. P.S. : The code in our Magento extensions are partially protected by ionCube technology. Templates and supported locale files (if any) can be easily modified.